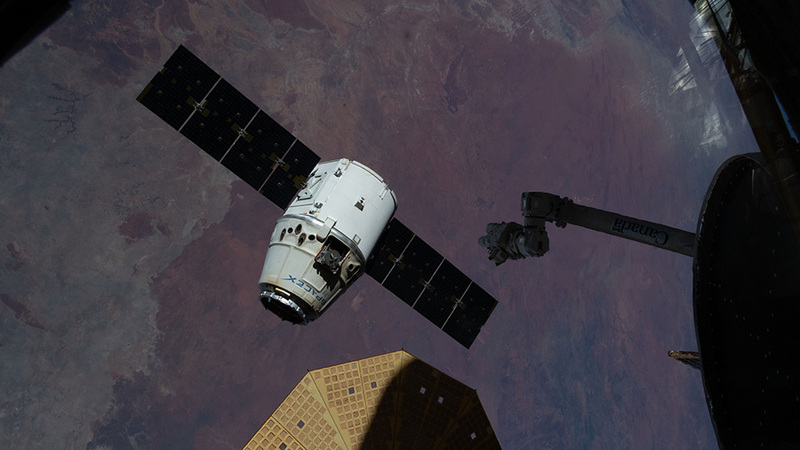 The SpaceX Dragon cargo craft begins its departure from the space station Jan. 13, 2019, moments after being released from the grips of the Canadarm2 robotic arm. The Expedition 58 crew members started Tuesday with an emergency drill before splitting up for more space research and hardware maintenance. Commander Oleg Kononenko led Flight Engineers Anne McClain and David Saint-Jacques through a simulated emergency this morning aboard the International Space Station. The trio practiced communication and coordination with Mission Control Centers in Houston and Moscow. The unlikely emergency scenarios the crew trains for include events such as depressurization, ammonia leaks and fires. Responses include quickly donning safety gear, closing a module hatch to isolate pressure and ammonia leaks, extinguishing a fire and evacuating the station aboard the Soyuz crew ship. McClain then moved on to cable and parts work on the Multi-Purpose Small Payload Rack (MSPR) that can house a variety of smaller experiments. She wrapped up the day photographing Saint-Jacques as he installed neutron detectors for an experiment to understand how space radiation impacts astronauts. Kononenko worked today on the Electromagnetic Levitator that exposes materials to extremely high temperatures to explore their thermo-physical properties in the microgravity environment. The four-time station cosmonaut later went on to routine maintenance on life support systems in the orbital lab’s Russian segment. hello ! I am a of fan of NASA , and since there will be a demonstration launch of the space x dragon capsule and also a plan of launching a crewed dragon capsule to the international space station in June , I wanted to ask is that will the number or the frequency of spacecraft getting to the international space station increase and will there be more astronaut on the space station . Thank you for your time to see this comment and I hope NASA will reply me as soon as possible .